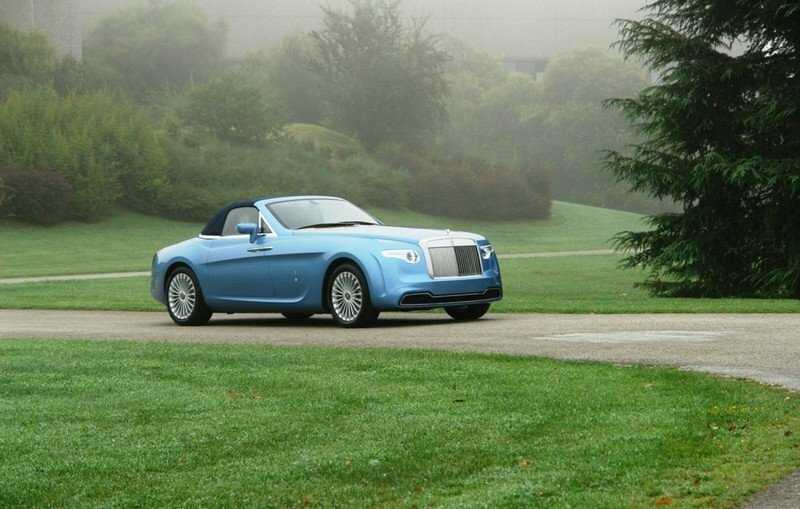 Way back in 2008, Pininfarina – a custom coach builder – took a look at the $400K Rolls-Royce Phantom Drophead Coupe Convertible and simply thought it just wasn’t good enough. So Pininfarina took this nearly half-million-dollar machine and created a one-off custom vehicle out of it. The maker then dubbed it the Hyperion, which was taken from an Ancient Greek Titan. Much like its closest competitor, Bentley, Rolls-Royce has always been one of those car companies that you either loved or hated, mostly due to their gaudy exteriors and even more outlandish pricing. For those that love them, but just need a little something extra, there is no shortage of custom car builders that will customize them to your liking. 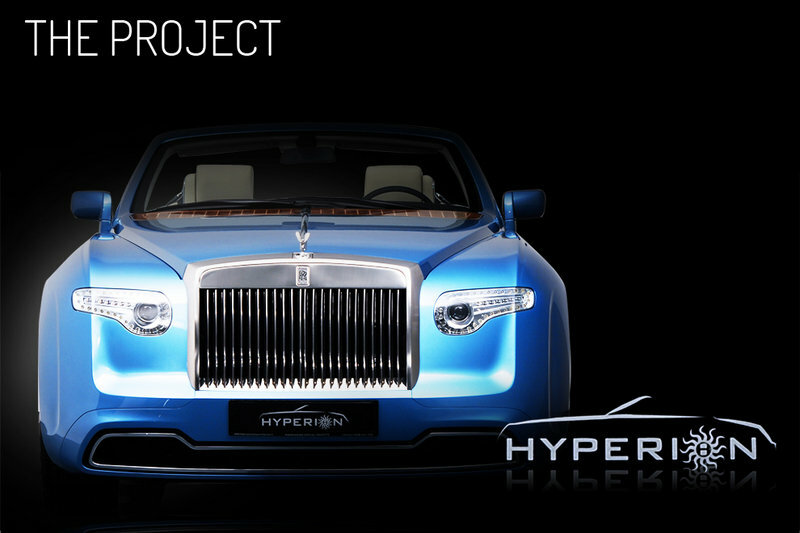 Despite the number of custom car builders modifying these ultra-luxury cars, none can touch the uniqueness and flashiness of the Hyperion. Pininfarina took special care to closely integrate a vintage look – taking styling cues from the 1930s and 1940s – with modern technology and feel. This monster of a luxury car originally debuted at the 2008 Pebble Beach Concours d’Elegance. 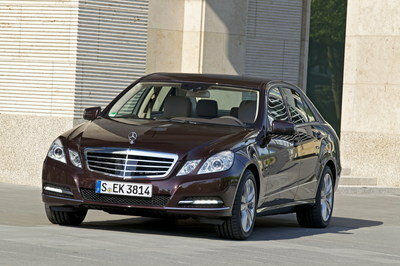 It then made an appearance at the 2008 Geneva Auto Show before going off to its rightful owner, Roland Hall. Let’s take a look at how the 2008 Pininferina Hyperion stacks up. Click past the jump to read the full review. On the outside, the first part of this machine that stands out is its extremely long hood, that resembles ultra-luxury coupes of the 1930s and 1940s. This is thanks to Pininfarina moving the driving position rearward about 400 mm (14.75 inches), which of course eliminated the possibility of it having rear seats. Behind the hood are two wooden storage compartments, which are carefully crafted into the design of the car, which Pininfarina designed to hold the original owner’s rifles. Behind the front seats is a wooden deck, resembling the storage containers behind the hood. Pininfarina crafted the body from carbon fiber, making it both strong and light, not to mention super expensive. The only non-carbon fiber parts of the car are the doors. By looking at them you would figure they are steel or aluminum, but in actuality, they are carved from solid wood. 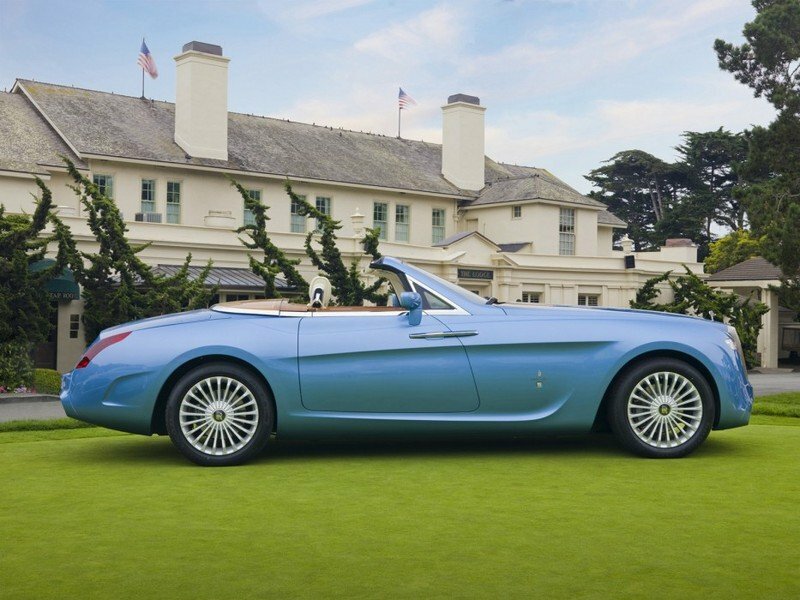 Pininfarina eliminated the awkward looking headlights and taillights from the Phantom, and replaced them with more fitting teardrop-style headlights and elongated vertical taillights. The Hyperion’s body features more rounded fenders than its original donor car, and a longer trunk. Lastly, the Hyperion’s rear bumper wraps underneath the vehicle and two large rectangular exhaust tips come from two holes in the bumper. 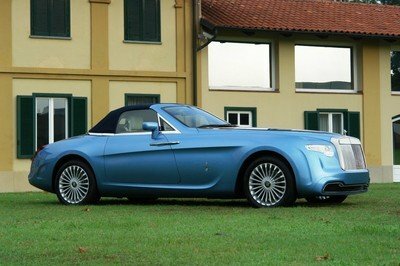 From the side, the entire Pininfarina looks much more stylish and aerodynamic than its donor Phantom. It also features a raised beltline that spans from about the halfway point on the front fender to just behind the door. Like all Rolls-Royce models, this bad boy is large and in charge. 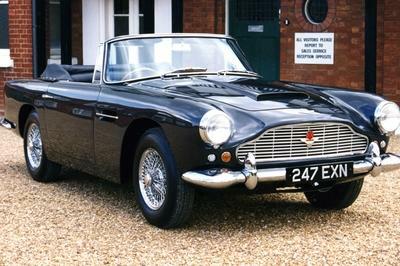 Its donor car measures in at 78.2 inches wide, 62.2 inches tall, 220.8 inches long, and it has a 130.7-inch wheel base. The Phantom Drophead weighs in at 2.88 tons (5,776 pounds), but since the Pininfarina has a carbon fiber body, we can anticipate some weight loss, but not too much. The inside of the Pininfarina remains almost unchanged from the donor Phantom, with exception to its lacking rear seats, of course. Another difference is that Girard-Perregaux designed a watch specifically for the Hyperion that attaches to the dashboard. The owner can remove the watch from the dashboard and connect it to an included wrist bracelet. 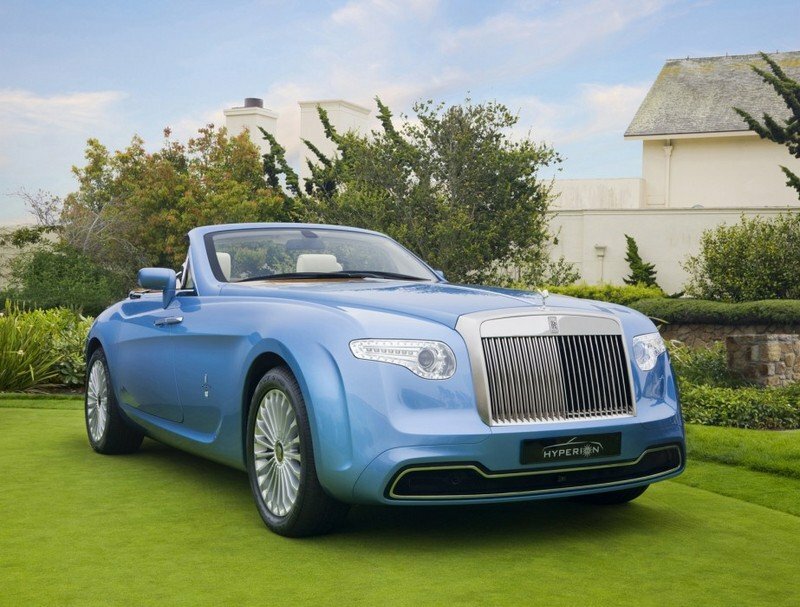 As we said, on the inside this custom car is simply a Rolls-Royce Phantom Drophead Coupe. This means it includes the Phantom’s awesome off-white leather-trimmed interior along with real wood trimming on the dashboard and doors. It also features an instrument panel and dashboard that are so simple, they deserve a standing ovation. This is one area that many custom car builders tend to ruin the character of a Rolls-Royce with. They like to add all the modern gadgets and gizmos that Rolls-Royce chose not to add. It also features the same 15-speaker Lexicon sound system, which includes two subwoofers and 7.1-channel surround sound. What makes it even more awesome is that the audio interface does not resemble something out of a space shuttle. It is simple, yet refined. Also included is a DVD-based navigation system and a Bluetooth wireless data link to hook up your hands-free Bluetooth phone. Just like the interior, the Pininfarina Hyperion’s drivetrain is a carryover from the Phantom. 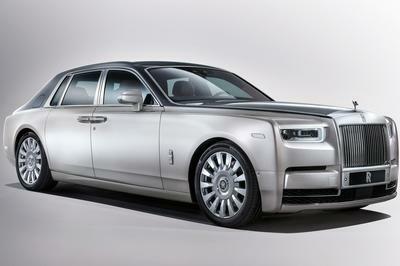 This is certainly no downside though, as the Phantom features a rather impressive drivetrain. It features a 6.7-liter V-12 engine that cranks 453 horsepower at 5,350 rpm and 531 pound-feet of torque at 3,500 rpm. 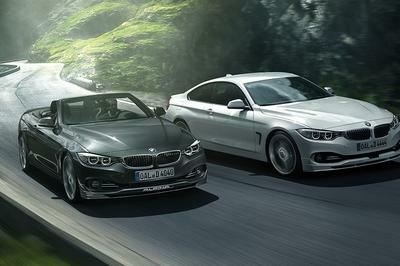 This beast links up to a six-speed automatic transmission that slings power to the rear wheels. This combination propels the Phantom to 60 mph in just 5.7 seconds. We would assume that the Pininfarina Hyperion would be slightly lighter, given its carbon fiber construction, and therefore a little quicker to 60 mph. 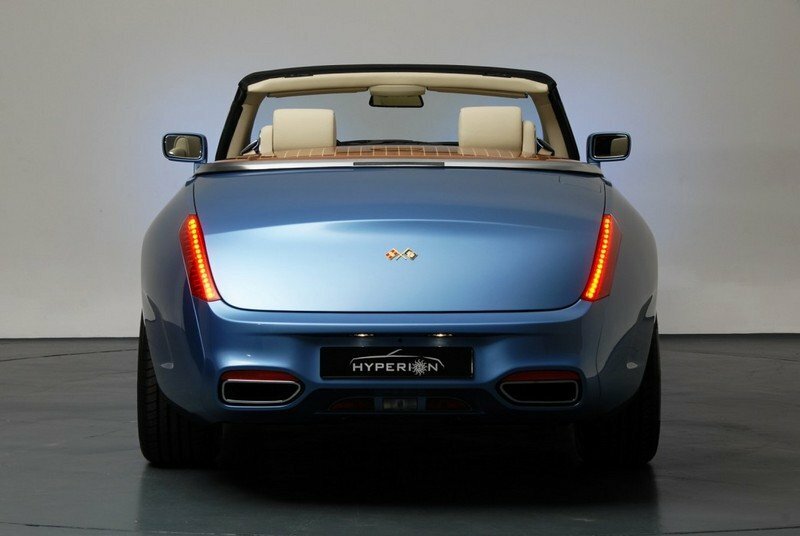 The Pininfarina Hyperion’s suspension and chassis are again completely identical to the Phantom Drophead, featuring double wishbone front suspension and multi-link rear independent suspension. This provides its passengers a great ride and some stability in the corners. This nealy-3-ton beast is no sports car, so don’t anticipate taking a slalom course at 70+ mph, if it’ll fit in a slalom course. Does it really matter? This is sort of like walking into a fancy restaurant and seeing that nothing has a price on it. If you gotta ask, it’s likely too much. 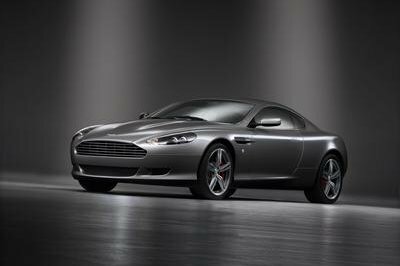 If you really have to know, there are rumors afloat that the car sold for $6 million back in 2009, and this type of car does not depreciate. The car just popped up again for sale at Prestige Cars in Abu Dhabu, United Arab Emirates and the seller has not disclosed a selling price. Changes are this one-off model will fetch in excess of $7 million. Pocket change for an Arab oil tycoon, huh? Um, it’s a custom built super-luxury car. Competition is out the window on this one. What more is there to say? This is one of those cars that will put you in an elite class of people. So, if you have $7 million lying around to go blowing on a new set of wheels, then this is the car for you. If not, let the drooling commence! Wow, it feels like I’m going back to the past. It looks like old school for me but looks great!